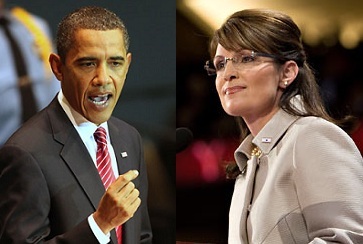 This entry was posted on Monday, August 15th, 2011 at 02:05 and is filed under Barack Obama, Politics, Sarah Palin. I am so tired of everyone trashing George Bush. Remember that the Democrats took over Congress in 2007 and spent the money and blamed him. If I get angry at him at all it is because he didn't veto everything they did. Remember it was the liberals effort to take him down and you buy in it. I love Sarah Palin. She isn't going to take any crap from the liberals. Shelly, I am not trashing Bush, but his problems with spending didn't begin in 2007. They certainly accelerated then, but both the Medicare Prescription Drug program and his education bill, both colossal expenditures, were created well before Democrats ran Congress. George Bush was never actually a conservative, and many people couldn't look past the "R" after his name to notice it. Not everything he did was horrible, unlike our current president, but whenever George Bush promoted another liberal idea, few conservatives called him on it because he was their guy, at least theoretically. George Bush did more to hobble conservatism than any I can remember because he claimed to be one while actually governing like a typical RINO. He started more big government programs in his first four years than Bill Clinton did in eight. Like in anything else, after pushing him into those things(just like liberals pushed his father into Tax hikes,) they then railed against him for not doing enough. So much for 'compromise.' Was he a decent war-time President? Yes. Did he do anything to help avert the fiscal crisis we now face? Clearly, not nearly enough. As bad as Obama? Nope. No way. If that's the best we can say of him, it's best to leave him in the past. The best way for Sarah Palin to remain out ahead of the curve is to do as Margaret Thatcher suggested to the elder Bush: "Don't go wobbly." Like you, I think there's virtually no chance Governor Palin would go wobbly. Very good read Mr America…and i agree …there are two Americas and we seek restoration of our liberties . Thank you sir. You know I think you are so totally correct about Ms. Palin, but my big fear is that nobama and his minions will subvert the election and even the election process.And I just dont see the sheeple getting off their asses to do what needs to be done!!! Hey as far as I am concerned the election process has alreaedy been subverted by letting Obama even be eligable to run for office with a questionable birth certificate. wow, a very well written piece that I can use against the Palin haters I encounter. Thank you very much!! !